Chicago is a beautiful city with great architecture, magnificent parks, but more importantly… an excellent restaurant scene. Chicago is a must stop for any American foodie. Restaurants such as Alinea, Moto, and Next have brought tremendous notoriety to the city and pushed the status quo for molecular gastronomy in the US. While the windy city offers a strong selection of fine dining and michelin star service, the most enjoyable meals are usually found at somewhere a little more chill… Remember Stephanie Izard the winner of Top Chef Season 4? Well Girl and the Goat is her first restaurant… and its fantastic. Girl and the Goat sits in the heart of lively Randolf Street and the vibe from the street carry’s on into the restaurant. As soon as you walk through the revolving front door you will find a welcoming fun and playful feel. The staff is bustling and the roar from chattering guests fills the dining room. An upbeat soundtrack of contemporary rock sits on top of it all and it is not uncommon to find staff singing while they take away your plates. The crowd is trendy but casual and laid back. The space has a rustic industrial look with high beamed ceilings and exposed piping. Dark wooden floors and tables fill the airy space with warm tones There is a large funky painting in the dining room of a girl and a goat that will immediately capture your attention, but the focal point of the room is the fully exposed kitchen. The kitchen stretches across the entire back wall of the dining area marrying the kitchen and dining room. The glow from the wood fire grills shine off the stainless steel and mist off smokey hot food wafts its way through the dining room. Girl and the Goat brings a very eclectic menu broken down into 3 categories: V (vegetable), F (fish), M (Meat). 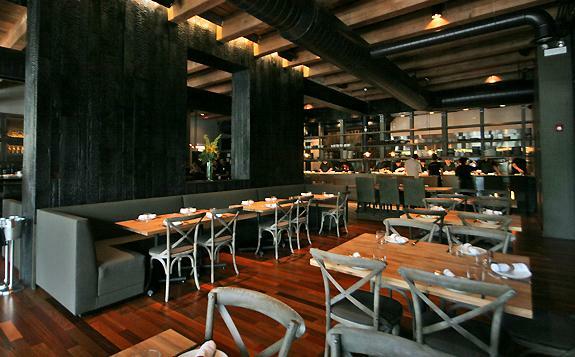 There is a second menu showcasing daily bread, oyster dishes, and goat dishes. Dairy and gluten free menus are also available. The menu changes often and features proteins and produce sourced from local farms. Dishes tend to be on the smaller side and come out when ready. The best way to enjoy the menu is to order a smattering of choices and share with your table. Each dish showcases a creative interpretation of the ingredients and carries a depth of flavor that feels soulful. Pan fried Shisito peppers bring spice balanced with parmesan and cooling miso. The clean fresh flavors of Hiramasa crudo are mixed with sinful crispy pork belly and a cutting chili aioli. Beef tongue is braised till tender and mixed with masa and salsa verde. Goat is elevated to a level most have not experienced. Confit goat belly with lobster, crab, bourbon butter and fennel is arguably the most memorable dish on the menu. The service throughout dinner is casual and fun but also attentive and unobtrusive. The menu will be explained in depth and the staff seemed to carry a sense of pride that they were a part of this establishment. I’m so jealous you got to go here! I’m a huge Top-Chef fan! I will definitely will be visiting if I ever visit Chicago! Great post! Thanks!! Glad you liked the post. Yea it was really a great dinner. I also very much enjoyed Blackbird restaurant and Avec in case you hit up Chicago anytime soon.